While the G: loves to keep the Gold Coast moving, there is one thing the G: cannot carry safely; bicycles. G:link has a similar style and shape of design to a heavy rail train, but our carriages are thinner, to accommodate our movement through an urban environment. As such, there is not a lot of room in the corridors of carriages to accommodate a bicycle, and a bicycle in the entryway can impede the movement of passengers in and out of the tram. A bicycle’s gears, pedals and handle bars, are all components that are sharp and could potentially injure someone should control of the bicycle be lost. Unlike heavy rail, our light rail service does not have its own corridor and we interact with traffic, intersections and pedestrians along the majority of our network. In terms of distance, our stations are close together, which means our trams are frequently stopping. Our trams stop often for traffic lights and stations, all of which increases the risk that an unstable item, like a bicycle, could fall over or shift, causing injury. Our interaction with traffic also increases the likelihood of an emergency brake being applied to avoid collision or a hazard. Our trams weigh 60 Tonnes. An emergency brake uses a great deal of force to stop the tram suddenly; force that could cause bicycles to fall over, shift or even slide down the carriages. While bicycles are not allowed on G:link services, every station does have bicycle parking facilities available. Stations like Broadbeach South, Cypress Avenue, Southport, Griffith University and University Hospital have bike enclosures, which will keep your bicycle out of the elements. Bicycles that are able to be stored in a bag; measuring 90cm X 70cm X 36cm are able to brought on any G:link service, at any time. Not only does the bag make the bicycle easy to carry and hold, it eliminates any risk of injury from handlebar, pedals or gears. 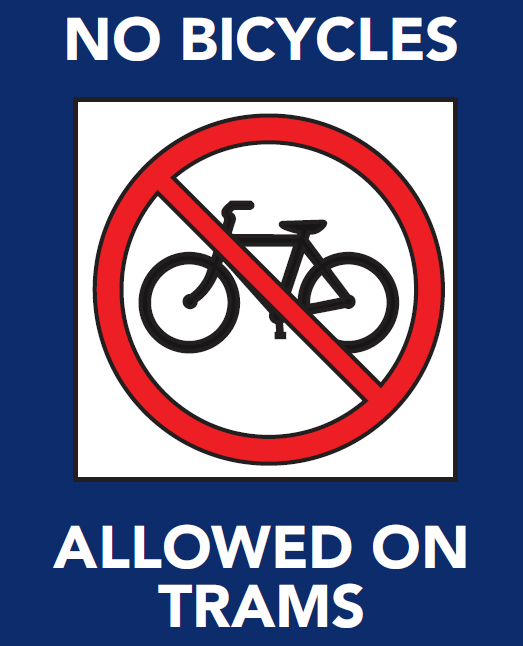 It is common for Australian bus and light rail services to prohibit bicycles due to safety and crowding concerns. For more information about TransLink’s tips for travel visit here. For more information about fares, ticketing or to plan your journey visit TransLink or call 13 12 30.